Operation System: Windows XP, Windows Vista, Windows 7. 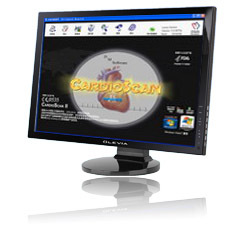 Can analyze Holter ECG recordings from both 3–channel recorders and 12-lead recorders. Enhanced ST analysis capability: 12-lead ST segment trend scan and comparison, operator can reset the ST markers for any designated time period for re-calculating. Comprehensive 12-lead 3-D ST-trends are presented for easy identification of ischemia locations. Pacemaker analysis function enables the detailed study of pacemaker performance of various models: VVI, AAI, DDD, etc. Unique “OSAS” (Obstructive Sleep Apnea Syndrome) analysis function. Other powerful functions are: patient event button auto-correlation, QT dispersion analysis, HRV (Heart Rate Variability) analysis (time domain, frequency domain and Lorenz poincare plot), branch bundle block analysis, atrial-fibrillation and atrial-flutter analysis, FCG CADgram (only for 12-lead recorders. ), if 3-channel Holter recorders are used in orthogonal hookup, SAECG (Signal Averaged ECG) and VCG (Vector-cardiograph) analysis can be made. T wave alterance analysis can be done upon any selected ECG episode. Longer 12-second ECG strip can be printed for better arrhythmia observation. Can get the 24-hour ABP monitoring data, create the ECG vs. ABP report. Operator can transfer Holter report to remote location through Internet as easy as sending emails. Strong database management capability makes it easy to search patient with combined conditions, can output to or inport from CD. Holter reports can be transferred to the database server computer by using the “ECG Network Information System (ECG-NIS) ”, all data can be shared electronically. Can output ASCII data for further study and programming, support Germany GDT format. User can translate the software into local language easily, if software is not available in certain languages. If use A4 printing paper with ECG grid, can print ECG reports faster and use less ink when “Without Grid” is selected from software settings menu. Can print reports in colors.